Face it, very few of us have perfect, supermodel bodies or faces. While there may seem to be an overwhelming amount of evidence that falling short of such mythical levels of beauty is a real handicap, you needn't feel shortchanged. The women staring back at you from the pages of Elle and Vogue may be images of impassioned promises, but you, a living, breathing object of real beauty, are that promise, fulfilled. • Pleasing parts: Focus on a part of you that you really think is attractive ("think lips," "think legs"). If you are particularly proud of your legs, for example, you may want to wear dresses that draw attention to them. 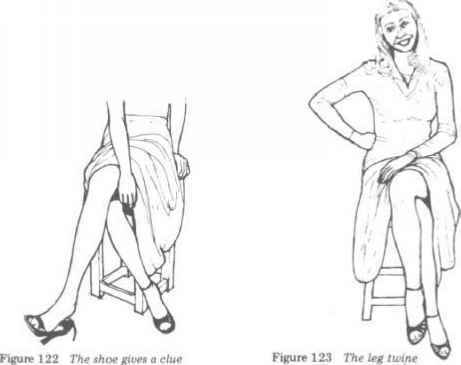 That doesn't mean you have to wear skirts so short that you can't sit down comfortably. The men I've talked to seem to actually prefer a skirt that is a bit above the knee, perhaps with a slit in the back. The quick glimpse of a little more thigh (and perhaps the hope of seeing a bit more) is frequently more tantalizing to a man than seeing everything all at once. Remember, men are visually oriented creatures, capable of intense fantasies. Inspiring those fantasies, even with a minimum of visual stimuli, can go a long way toward seducing a man. • Appealing apparel: In all you wear, look for a proper fit and feel, so that the garment makes you feel as good as it makes you look. Your clothes must allow you to move naturally and comfortably, adding to your sense of confidence as you wear them. In addition, your clothes need to look "touchable" to a man. While a crisply pressed business suit may communicate competence and confidence, your overall look needs to be less harsh than the common dictates of business attire. Run your fingertips across the fabric of your favorite outfits, and ask yourself what the material is saying. Look at the cut of your clothes, and ask yourself what your overall impression is. Then ask yourself if these are the things you want to communicate to the men in your life. If the answer is no, it might be time to do some careful shopping. • Finishing touches—for maximum touchability: The same approach applies to your hair and make-up. You want everything about you to look touchable, even inviting to a man's caress. Men have often told me that if a woman looks like the slightest touch would destroy her image, they simply won't want to touch her. In short, lose the shellac hairspray, ditch the three coats of industrial-strength mascara, and strip off a few layers of rouge. In addition, if you tend to trowel on the foundation, give the trowel to your favorite bricklayer. A man would much rather see a few real flaws than a perfectly applied coat of putty and paint. You will discover knowledge that most men will never know -and will never fully understand. It will show you why women simply cannot resist a man that can make them laugh in a deep and satisfying way. Plus, it will even arm you with the tools to deliver exactly that kind of satisfaction and pleasure to women...with laughter. This report is about to give your power back to you! So that you can be in control of the situation and attract women to you whenever and wherever you want.